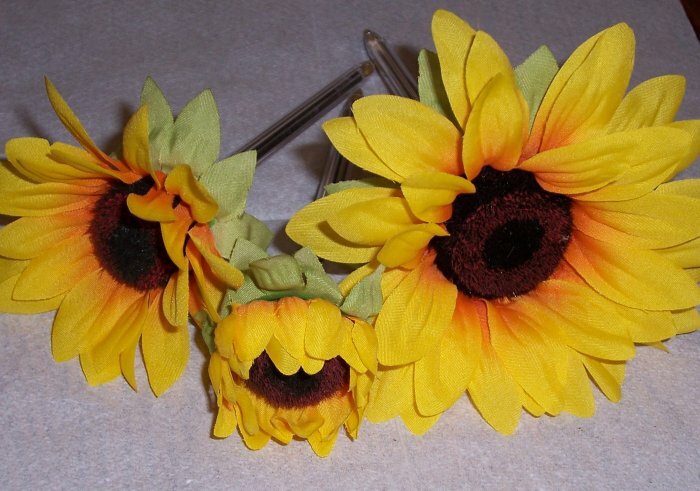 Bright and bold, these sunflowers make a great addition to your desk. Each fabric bloom is firmly glued into the barrel of a Bic Crystal stick pen. These pens are not wrapped. Flowers are Sunny Yellow. There are 3 sizes of blooms in this bunch, small(blossom), medium(day old), and large(full bloom). Price listed is per dozen, with 4 blooms in each size. As always, please contact me directly for larger orders/quantity discounts! I can do bulk orders of most items. I try to keep a good supply on hand, but for large orders (more than 50) and special colors, I'll need at least 2 weeks to produce, and then add another week for shipping, I want your special event to be stress-free, and that just requires a little planning! Send me an email for a price quote and I'll let you know the cost and and delivery ETA. As always, shipping in the lower 48 is included in the price. If you are an international shopper, I'll do my best to get a fair shipping price!